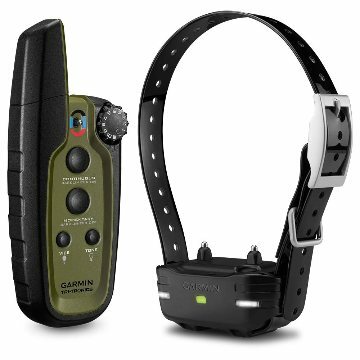 It allows you to train up to 3 dogs (additional PT 10 dog devices required, sold separately.). Quick turn dial gives positive clicks when changing between 10 stimulation levels and when controlling auxiliary functions. Includes a built-in BarkLimiter with settable levels to keep things quieter. Four buttons control continuous and momentary stimulation, vibration, tone and lights. Dog devices and collars feature interchangeable, replaceable long and short contact points. Features: Quick turn dial on handheld with positive clicks when changing between 10 stimulation levels and controlling auxiliary functions. Buttons on the handheld can activate tone signal and vibration control on the dog device. Remote control of LED beacon lights on the dog device for low light conditions; visible up to 100 yards away. LED status light for quick, at-a-glance read. Long-lasting, rechargeable, user-replaceable, lithium-ion batteries for both handheld (up to 60 hours) and dog device (up to 60 hours); includes battery life indicator on handheld and dog device to know when to charge system. Built-in spine mount for use with Garmin accessories. Includes 2 lengths (long and short) of removable, stainless steel, insulated contact points for reliable performance in wet conditions and extended comfort for the dog. Compatible with 3/4” polyurethane-coated nylon collar straps.